Straddled across the twin provinces of Asturias and Cantabria in Northern Spain, the Picos Mountains are nothing short of breathtaking. Thousands of years of erosion and geological activity have created soaring limestone towers, and plunging cavernous gorges. This really is and awesome part of the world and well worth a visit. From the tip of Torre Cerredo the range’s highest peak (2 648m), to the raging Rio Cares, this amazingly compact range of mountains offers everything we are looking for in a ‘mountain getaway’. Also known as a fine reserve of wildlife it will certainly be possible to see a great variety of birdlife including broad winged vultures, eagles and certainly mountain goat, and possibly wild deer, but other sightings are strong possibilities. The undergrowth in summer is alive with wriggling lizards. Your trip will be an unforgettable introduction to Adventure in this inspiring high mountain environment. Day 1 - Meet Santander Airport latest by 15:00. Transfer to Poncebos. 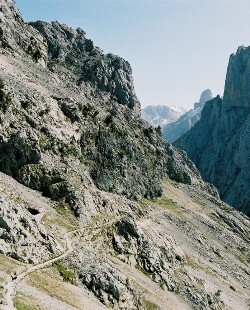 Short walk (Approx 1.5 hrs) to overnight accommodation in Bulnes which is only accessible by foot or funicular railway. 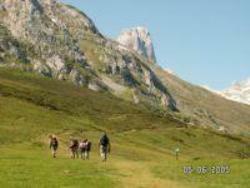 Day 2 - Depart Bunkhouse 09:00 and trek into the Picos for your overnight accommodation, Refugio Vega Urriellu (1903m) arrival by 13:00. Lunch at Vega Urriellu before setting off for the afternoon to explore the high Picos. Expect to be trekking to high passes of 2250m - with epic views across incomparable mountainscape. Day 3 - Depart Lodge 09:00. Further trek into high Picos mountains, climbing to over 2000m beneath the stunning & awe inspiring Picu Urriellu - before departing back to Bulnes for the evening! Arrival by 16:00. Overnight in our favourite hostal in the village of Bulnes. Day 4 - Depart Bulnes 09:00. Trek back to Poncebos before trekking down the famous Cares gorge for lunch in Cain. From Cain we will trek back to Poncebos and transfer back to the fascinating town of Arenas de Cabrales for a celebratory beer or two with a view back towards the Picos! Day 5 Depart Arenas 10:00 transfer back to Santander Airport for your journey back to the UK. Night 2 - High Adventure in the mountains - wild and away from it all at the Vega Urriellu mountain refuge in the heart of the Picos. Simple standard, and simple food. Night 3 - Simple Rustic Bunkhouse back in Bulnes with hot showers and great food. Night 4 - Hotel in the historic town of Arenas de Cabrales. Most likely is glorious hot temperatures and warm sunshine, although rain and overcast conditions are surprisingly common here for Spain. This is due to the proximity of the Atlantic. Be prepared for all weather conditions especially if heading into the mountains..
Never thought I would admit to miss the pains & aches from our Picos Mtns trip! But I really do! !